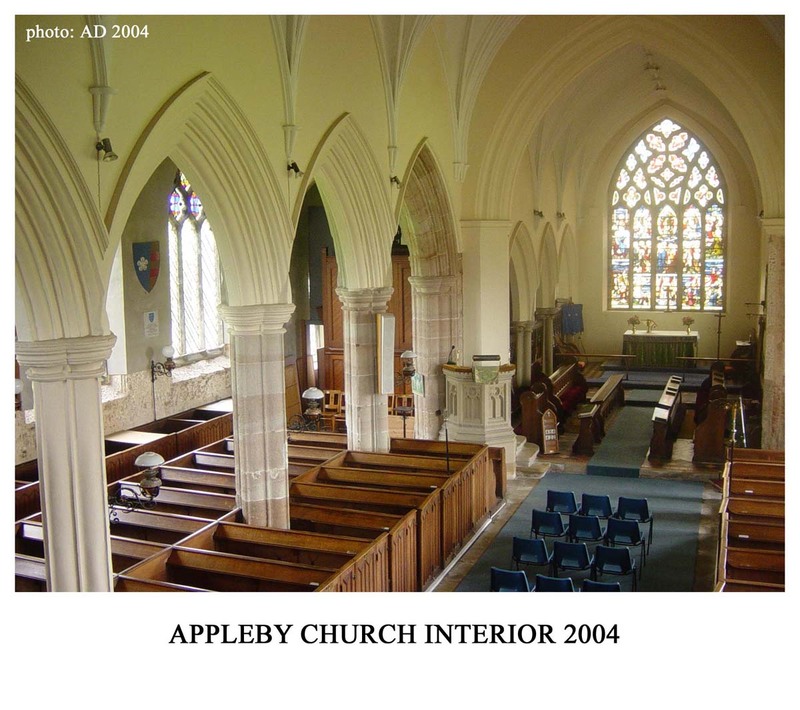 The work carried out on Appleby Church in the period 1829-32 (described in the last article) is always referred to as a 'restoration' but, in fact, it was a major remodelling of the whole building, inside and out. Further refinements took place throughout the later period spanning the long reign of Queen Victoria (1837-1901). In particular the chancel, largely untouched in 1829-32, was newly furnished in 1870-72 in line with current fashions of ecclesiastical design which reflected changing ideas about forms of worship. The 1829-32 restoration took place around the time of the accession of King William IV, in 1830, following the death of King George IV. The carved wooden shield mounted on the front of the rebuilt church gallery (used by the School) bears the Royal Arms with an escutcheon (small central shield) as used in the later Hanoverian period (1816-1837). 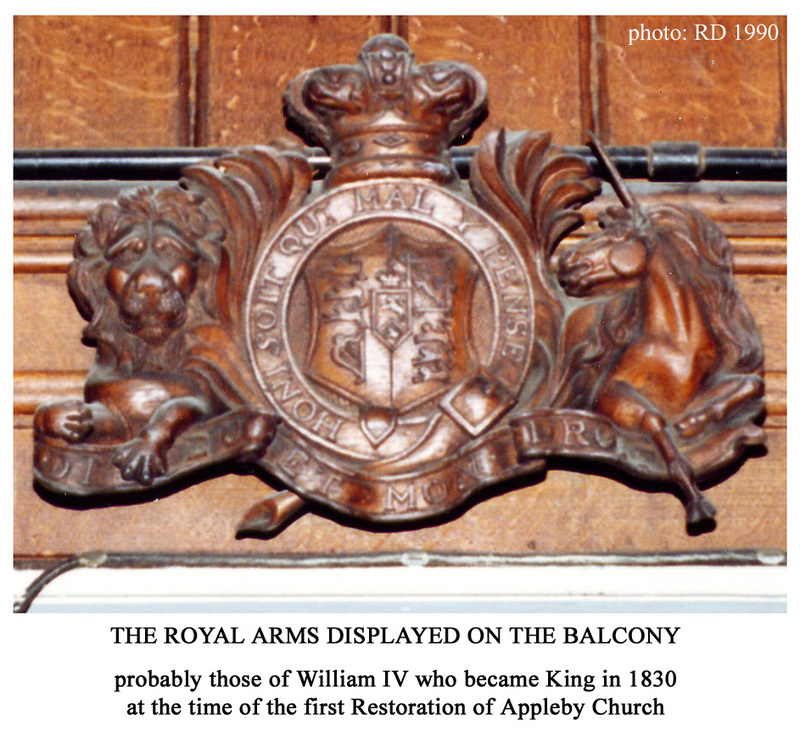 The coincidence of the church restoration with the accession of a new monarch provided the opportunity to display loyalty to the new King by incorporating his arms on the gallery (1). I have found no record of a service of re-dedication following the 1829-32 restoration work, but such a service would be expected. There was an enlargement of the burial ground which involved consecration of the new area. This was discussed in correspondence with the bishop so it seems likely that a special service did take place (2). Space had been left in a recess at the back of the School's gallery for an organ and in 1838 as a gift from the Misses Moore of the White House 'a handsome organ was put up', probably the first one to be installed in the church (3). There is space for only a small instrument in this location but the church's services must have benefited immediately. 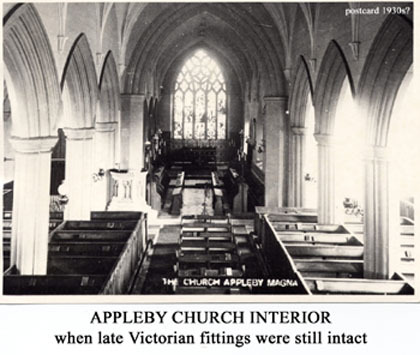 Just over 30 years later, a larger replacement was installed in the de Appleby chapel (see below). James Tunnadine recorded in his diary: '1838 Jan 4th Organ came to Appleby (by boat to Measham) from London -- W Gray builder. 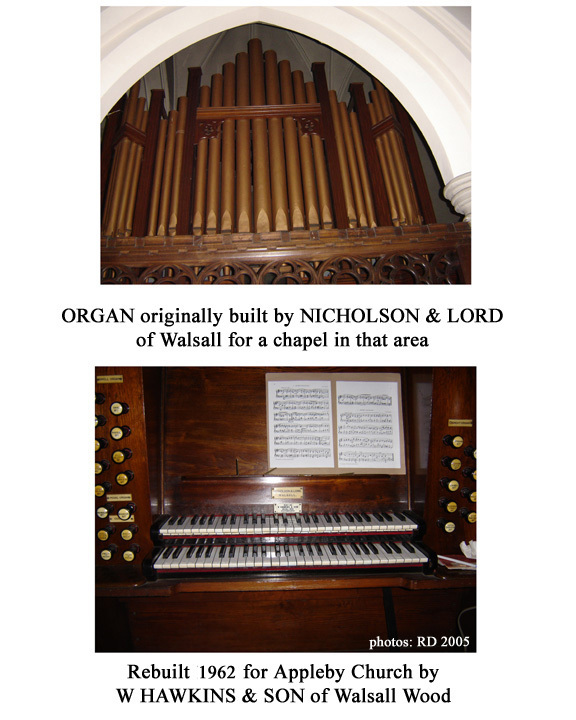 1838 Jan 28th Organ opened by Mr E Mammatt a blind man. ... 1841 Apr. 18th Gills first played organ' (4). Gray's organ builders were a well known and reputable London firm with premises in Pratt Street, Camden, close to the Regent canal (5). The national system of canals was sufficiently well developed by the 1830s to allow direct transport of goods by canal boat from Camden to Measham. On the horse-drawn boat, the Appleby organ would have travelled to Paddington basin along the Regent canal, then via the Grand Junction canal to Braunston in Northamptonshire, followed by the Oxford canal to Hawkesbury junction south of Bedworth. After a short length of the Coventry canal, the boat finally travelled from Marston junction to Measham along the Ashby canal (6). Mr Mammatt may well have been Edward Mammatt Esq. who is listed in Pigot's directory as a gentleman resident at 'Over Seal Cottage' (7). In 1850 a new church clock was installed as another gift of Misses Catherine and Elizabeth Moore (their sister Mary had died in January 1848). 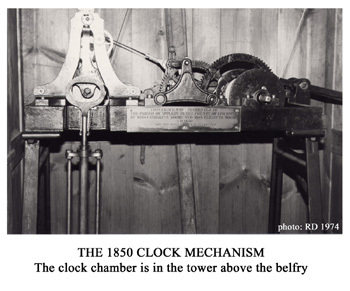 James Tunnadine observed: '1850 Mar 16th, New church clock put up given by Miss Catherine Moore and Miss Elizabeth Moore. Cost about 150 pounds also about £10 more for flooring for it to stand on'. That the clock was a replacement ('new') is clear from Nichols' account in which he refers to 'a good peal of six bells, of very modern date, and a clock'; ie there was already a clock in 1811. Pre-1850 trade directories (no doubt quoting Nichols) state that the church has 'six bells and a clock'. The earlier clock dial is also shown on the engravings of the church published by Nichols (8) (9). The inscription plate reads: THIS CLOCK WAS PRESENTED TO THE PARISH OF APPLEBY IN THE COUNTY OF LEICESTER BY MISS CATHERINE MOORE AND MISS ELIZABETH MOORE 1850. THE REVD. JOHN M ECHALAZ MA RECTOR, THOMAS FOSTER JOHN ALLDRITT CHURCHWARDENS. John Henry Newman, Vicar of St Mary's Church and Fellow of Oriel College, was one of a group of prominent Oxford theologians. In the summer of 1833, Newman published the first of a series of theological essays which were to become known as Tracts for the Times. Over the next eight years ninety tracts appeared with contributors including fellow priests John Keble and Edward Pusey. A little earlier, Keble in his book The Christian Year (1827) had written devotional verses for the feasts and and other calendar days of the Church of England's Book of Common Prayer (1662) and thus obliquely pointed to the sacramental nature of Anglican worship. Concerned at the secularised state of the Church of England, the Tractarians argued for its place as a reformed part of the Catholic Church descended from the Apostles. The logical consequence of this was the return to Catholic forms of worship with emphasis on the eucharist. Although Newman himself (convinced by his own developing arguments) converted to the Roman Catholic Church in 1845, his last article in 1841 had argued that the Thirty Nine Articles of the Book of Common Prayer were not incompatible with the doctrines of Rome. The influence of the Tracts had a huge effect on reviving the national church. The clergy were largely university men - educated at Oxford or Cambridge - and with many of them (although definitely not all) the arguments of the Tractarian Movement found a receptive audience. As we have seen at Appleby, many church buildings had been refitted after the Reformation as 'Puritan preaching boxes'. Under the influence of the Tractarians, many clergy set about making the altar once again the focal point of the building, where 'High Church' rites could be performed. Alongside the theological arguments, there was the development of ideas about what should be the ideal style for a church building and its furnishings. 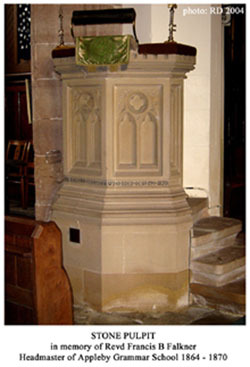 There was great interest in the medieval period at the time, which influenced secular buildings too, but perhaps the most important influence was exerted by one individual architect, Augustus Pugin (1812-52), who was an enthusiastic proponent of Gothic style in all its aspects, from the church buildings themselves down to the smallest detail of furnishings and fittings. During his short life, he provided a lead to his contemporaries (10). The Rector, Revd. John Manuel Echalaz M.A., had come to Appleby in 1830 as a young man (aged 29 years) during the earlier restoration work of 1829-32, seeing that work to completion following the death of Rector Jones. Some 40 years later he set about re-ordering the chancel. There is one clue that refurbishment of the chancel was his long-term aim. In 1852, almost twenty years before the main chancel renovation, two Victorian Glastonbury Chairs were acquired for the sanctuary (11). 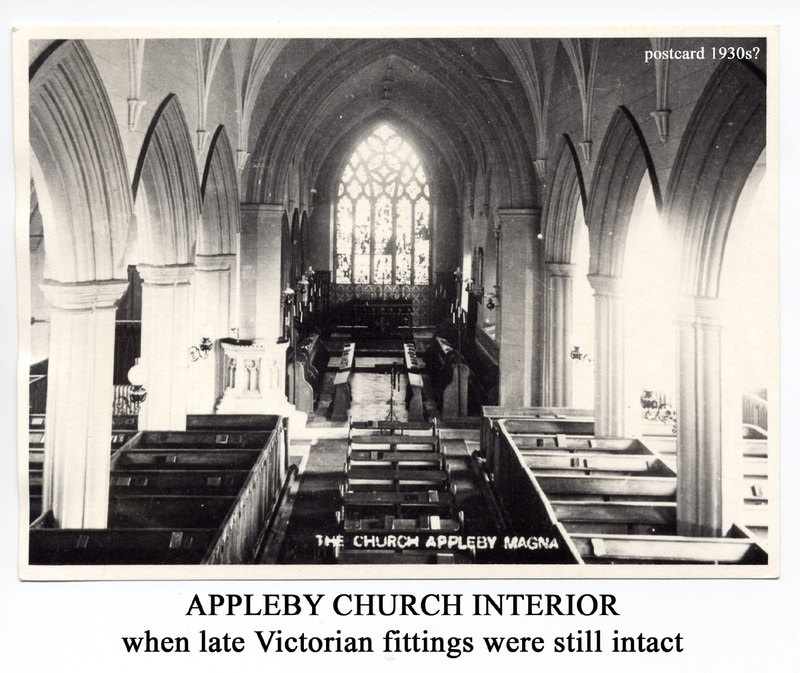 Although there is no direct evidence of Rector Echalaz's attitude to the Tractarian renovation of churches which was sweeping the country, the work put in hand at Appleby in 1871-72 demonstrates where his sympathies lay at that time. The new furnishings and fittings were all in accord with the ideas of the Tractarians. There appears to have been no opposition in the parish to such a radical alteration. Importantly, the Rector had the support of the squire and patron, George Moore of Appleby Hall, who donated £100 before his death in 1871. Mr Moore was also actively involved in corresponding with the architect (12). 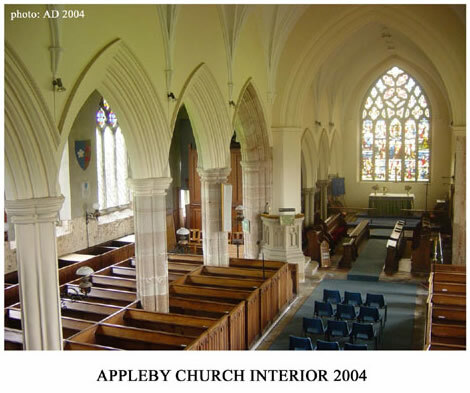 By 1870, a scheme for refitting the chancel of Appleby Church was drawn up by James Piers St Aubyn (1815-95), fellow of the Royal Institute of British Architects (from 1856) and member of its council at the time of the Appleby contract. He worked on several projects in Leicestershire and many others elsewhere in England (13). St Aubyn was paid £25 for his Appleby work. The local firm contracted to carry out the work was Joseph Lilley & Son (14). A subtle feature of the renewed chancel is the rising levels of the floor. The choir area has been raised (at the chancel step) by approximately 6 inches (15 cm). This is apparent from the position of the small blocked-off doorway behind the Rector's seat (15). Further steps were created at the east end of the choir stalls and at entrance to the sanctuary (at the altar rail); and a fourth step forms a plinth for the communion table (altar) itself. The result is to raise the altar to an exalted position, both literally and figuratively, as the focus not only of the chancel but of the whole church. The new raised floors were tiled in rich patterns typical of the period. 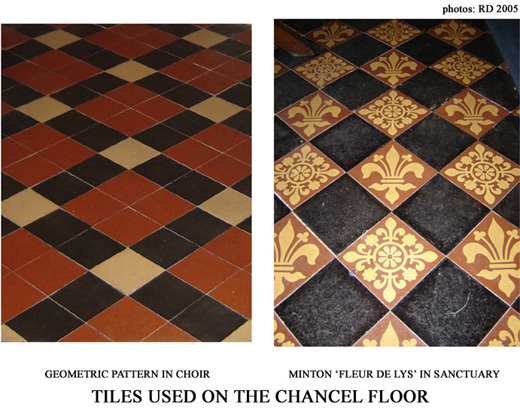 The choir area has plain tiles coloured red, cream and black in a diamond pattern. The sanctuary area surrounding the altar has glazed Minton tiles mixing two Fleur de Lys patterns with plain black (16). The patterns may be see in the following pictures. Among the 'extra items' for the chancel supplied by the contractors were a deal skeleton frame for the communion table and two deal standards for candles. Also a marble top for the table was to be repaired (14). 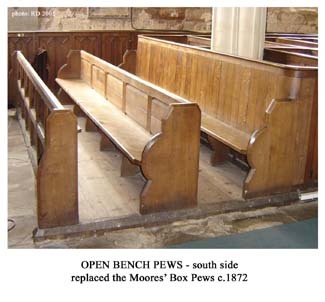 The main furniture for the chancel consists of seating for the choir and clergy and the whole area was separated from the vestries (the old chapel) by an elaborate screen.. These were all made of oak to the design of the architect James St Aubyn. A recent view of the choir stalls and screen is shown in the photograph. The other two pictures shown here are from a postcard photograph taken probably in the mid-1930s when the late Victorian fittings were still intact. The altar is dressed in liturgical colours (probably the red frontal for Whitsun and visible in the close-up detail) and behind the altar under the east window is a screen, or reredos, with a patterned design typical of the period. This screen appears to be matched by curtains rising to a higher level in the corners on either side. The reredos and curtains were removed in the mid-20th century when the rich High Church style was rejected in favour of plainer appearance. 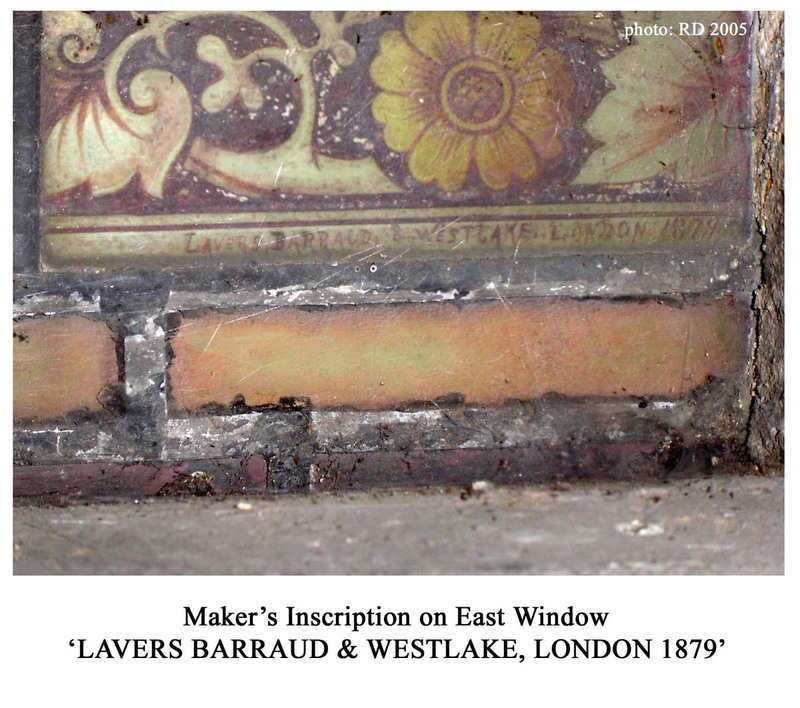 5½ yards of Fleur de Lys Drugget was ordered from Frank Smith's Ecclesiastical warerooms. This hard wearing floor covering was possibly intended as a protection for the Minton floor tiles in the sanctuary, whose pattern it echoed (17). It also had the practical property of keeping the feet of the clergy insulated from the cold floor. This carpet has also not survived; neither has it been replaced. 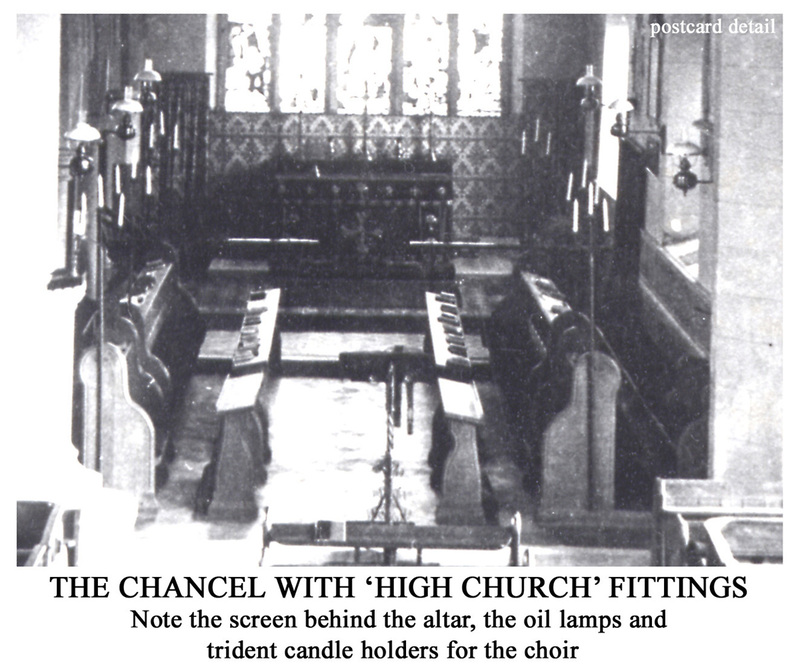 The choir and clergy seats have oil lamps mounted on the walls behind them and the stalls themselves have trident style candle holders. These may well be the iron and brass triple lights payment for which was acknowledged in January 1873 (18). 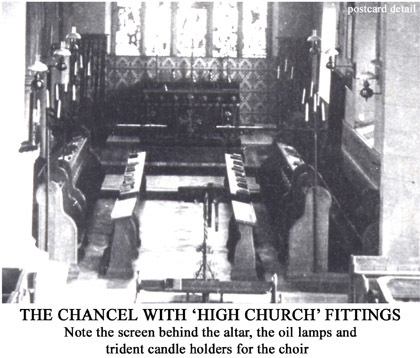 The old lamp brackets may be seen high above the choir seats and the support brackets for the candle holders remain on the seat ends. There are two windows on the south side of the chancel both of them holding pictorial scenes in memory of members of the Echalaz family. 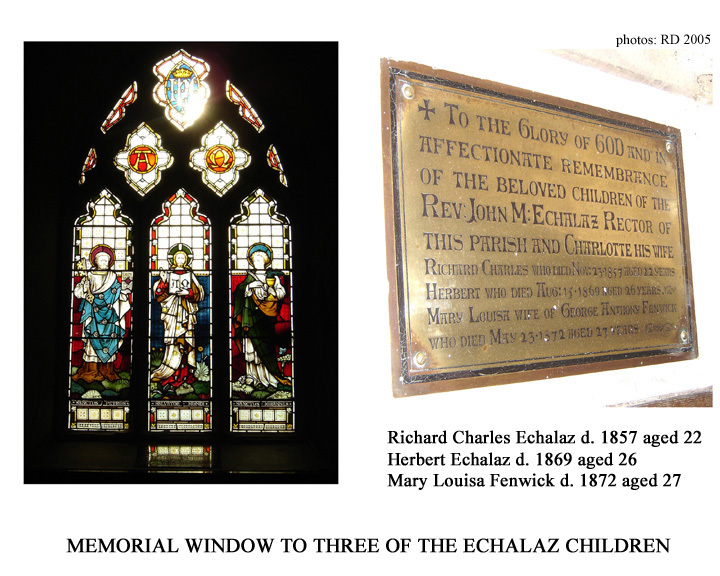 Three of the rectory children, Richard, Herbert and Mary died young - in their twenties - and the window overlooking the choir stalls commemorates them. The circumstance of Richard's tragic death was recorded by James Tunnadine: 1857 Nov 22nd Ricd Echalaz killed by his horse leaping at an unseen tollgate in the dark at Canterbury (4). The composite window shows Jesus, Saviour of the World (Salvator Mundi) between St Peter (with the key) and Gospel-writer St John (holding his quill). 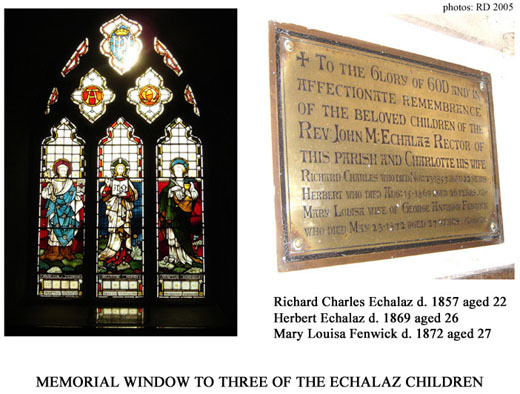 The other chancel window, overlooking the sanctuary, is in memory of Rector Echalaz and his wife: To the Glory of God and in memory of John M Echalaz M.A. 46 years rector of this parish died May 6th 1877 also of Charlotte his wife died October 20th 1880 by their surviving children. The burial register shows that the rector lived 76 years and his wife 75 years. The window, again in three sections, shows Jesus between two disciples. The inscription 'Abide with us for it is toward evening' are the words of the two disciples whom Jesus met on the road to Emmaus after the Resurrection (Luke 24: 29). They are the words which inspired the hymn 'Abide with me'. With the refurbishment of the chancel, there was a change of emphasis between pulpit and altar, the latter now having more prominence. It was consequently decided to replace the old dominant pulpit by a more modest construction placed against the north respond of the chancel arch. In October 1870 the headmaster of Appleby Grammar School, Revd Francis B Falkner MA, died and a new stone pulpit was erected in his memory (19). The gothic tracery motif used is (to this writer's eye) less successful than the restrained decoration of the font. There was also need for a new lectern. A design was prepared in March 1871 for one to be executed in Wainscot oak - not varnished or oiled but this cannot have been constructed (20). An invoice for £14 survives for a polished brass lectern and case dated 17th January 1872. This 'eagle' style lectern was purchased from John Hardman & Co of Birmingham, a well-known ecclesiastical supplier favoured by Victorian church architects (21). At first the 1838 organ (see above) was taken down from the gallery and repositioned behind the choir stalls (on the north side) in the western bay of the Bosworth chapel. However by July 17 1871 an estimate for a new organ at a basic cost of £250 had been obtained from Foster & Andrews Organ Manufacturers of Hull. This must have been considered too expensive, because an organ by Coleman was purchased on May 6th 1827 for £126. £26 was allowed against this for exchange of the old one (22). The establishment of the altar as the main focal point of the building and the construction of a pulpit against the chancel arch meant that the box pews occupied by the Moores were no longer suitable. 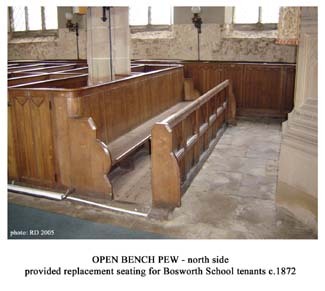 In addition, the installation of an organ in the old chapel, together with its use as vestries, led to the complete removal of the Bosworth pews. Replacement seating took the form of new pews at the front of the church, two benches on the south side for the Moores and one on the north side for the Bosworth tenants. All of the ground level congregation were now facing the same way. 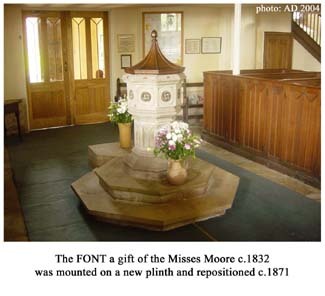 A further consequence was that the Misses Moore's font, which had been placed at the east end of the north aisle in the 1829-32 renovation, now required more space and prominence, so it was moved to the a central position at the west end of the nave in front of the main entrance, where it remains. Joseph Lilley built the new stone base, with steps, on which it was mounted (14). That then was the state of the church and chancel which Rector Echalaz saw in his lifetime. He died in 1877 and his wife in 1880 as we have seen from their memorial window (above). But further embellishments to the building have continued from time to time. Squire George Moore died aged 59 on 26th August 1871 as the chancel work was starting. His wife Isobel Clara had died earlier, aged 56, on January 17 1867 (23). Following the completion of the chancel remodelling, there was a delay of eight years before a new east window was completed in their memory. 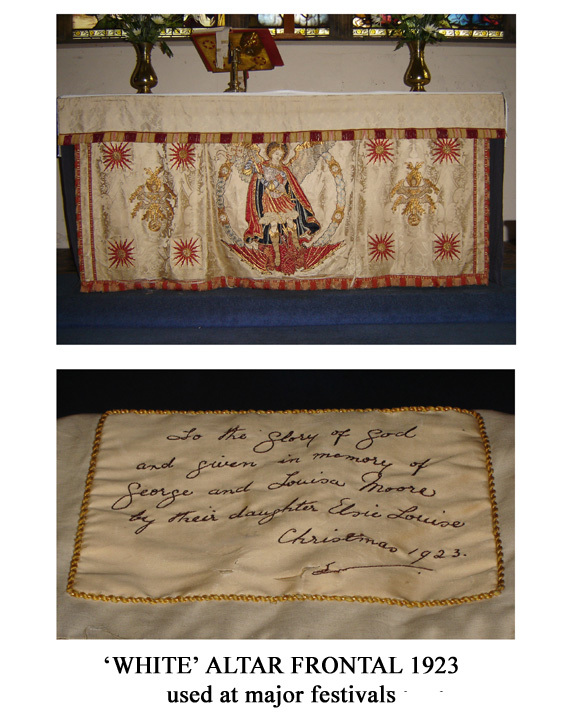 A design by James St Aubyn was not implemented at the time of the 1870-72 chancel work because of cost (24). When the window was eventually constructed in1879, St Aubyn's design does not appear to have been revived. The window is inscribed with the makers' name and the date in the bottom right hand corner: LAVERS, BARRAUD, & WESTLAKE, LONDON 1879 . 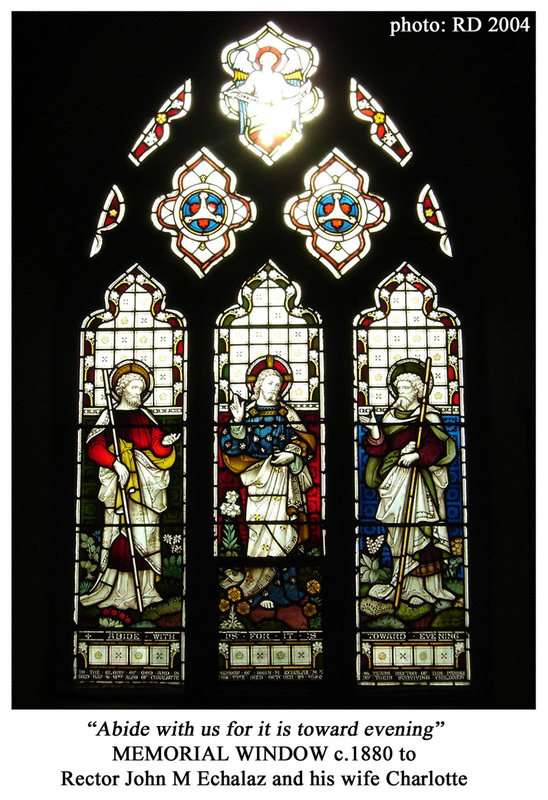 This firm designed and manufactured stained glass windows in the period 1855 to 1921. It seems most probable that they designed the window 'in house'. Nathaniel Westlake (1833-1921), a specialist in the Pre-Raphaelite style, joined Lavers and Barraud in 1858 and became principal designer and a partner in 1868. 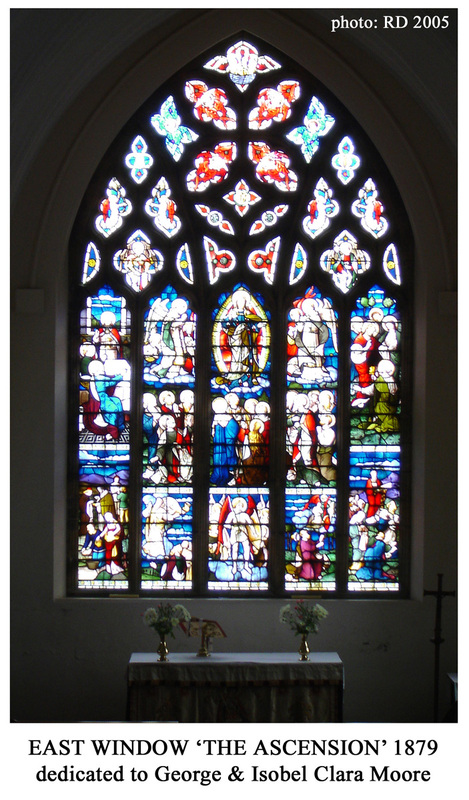 Although Grove's Dictionary of Art claims that their work after 1868 lacks the inspiration of Westlake's earlier originality, the Appleby East Window of 1879 is truly magnificent. 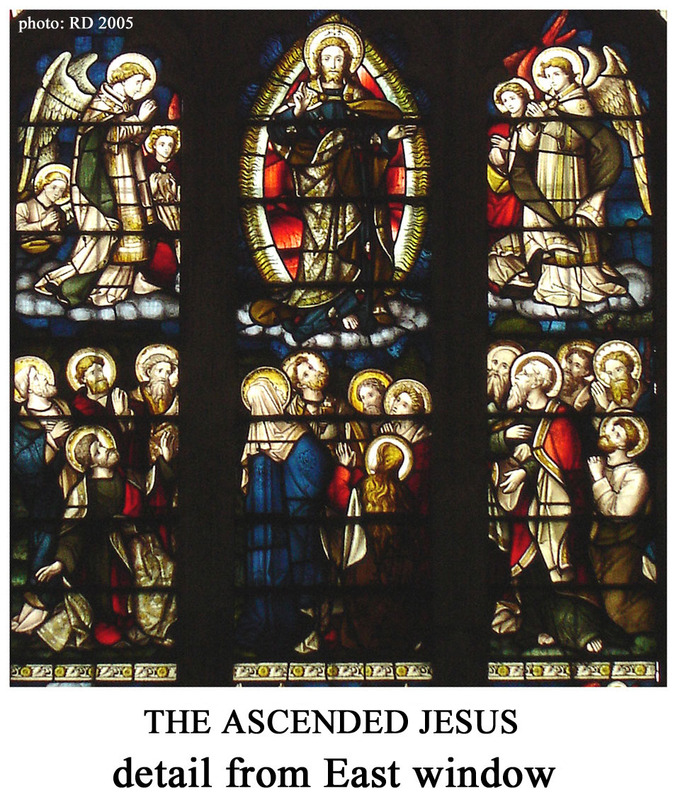 The complex array of individual figures in multiple panels around the central theme of the ascending Christ, with its skilful arrangement of colour, is a masterly composition well executed. 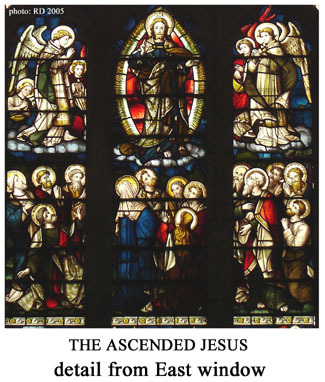 The subject of the east window is that of the The Ascension of Jesus into Heaven. The dramatic events which led up to the Ascension are described by St Luke in the last chapter of his Gospel and the first chapter of the Acts of the Apostles (also written by Luke). Jesus last appeared to 'the eleven and those who were with them' at Jerusalem (Luke 24:33, RSV) and subsequently he took them to the village of Bethany, which is about two miles east of Jerusalem on the far side of the Olivet ridge or 'Mount of Olives' (vv.50-51). At Jerusalem he had 'opened their minds to understand the scriptures' concerning his death and resurrection; at Bethany he reassured them with the promise of the Holy Spirit and was then taken from them: '...as they were looking on, he was lifted up and a cloud took him out of their sight. And while they were gazing into heaven as he went, behold, two men stood by them in white robes, and said, "Men of Galilee, why do you stand looking into heaven? This Jesus, who was taken up from you into heaven, will come in the same way as you saw him go ...' (Acts 1:9-11). In the Appleby window, the principal scene of the Ascension is shown in a central block of six panels (see detail picture). Jesus, with his right hand raised in blessing, is shown flanked by angels. Immediately below, Mary his mother in a distinctive blue robe displaying the letter 'M', Mary Magdalen with her golden tresses and twelve of Jesus's male followers, spread across three panels, gaze upwards at the ascending Lord. The twelfth man shown with the 'eleven' might represent one of Jesus's brothers or Judas son of James, all of whom were with the group when they subsequently returned to their lodgings at the upper room at Jerusalem (Acts 1:12-14). Matthias of course had not yet been chosen to replace Judas Iscariot (v.26) and Paul's conversion was to come later (Acts 9). 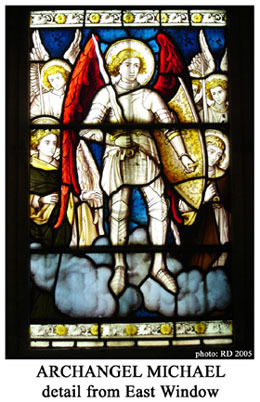 In the centre at the base of the window is the winged figure of the Archangel Michael, with sword and shield, accompanied by other armed angels of the Heavenly Host. The Michael panel (next detail), with its simple bold design, exhibits characteristics of the Pre-Raphaelite style of Westlake. 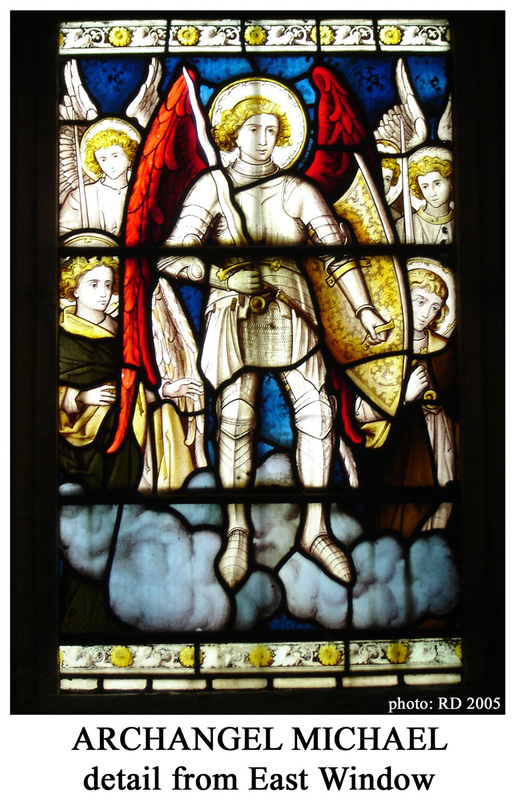 He has neatly incorporated the dedication saint of the church into the window without overpowering the main theme. 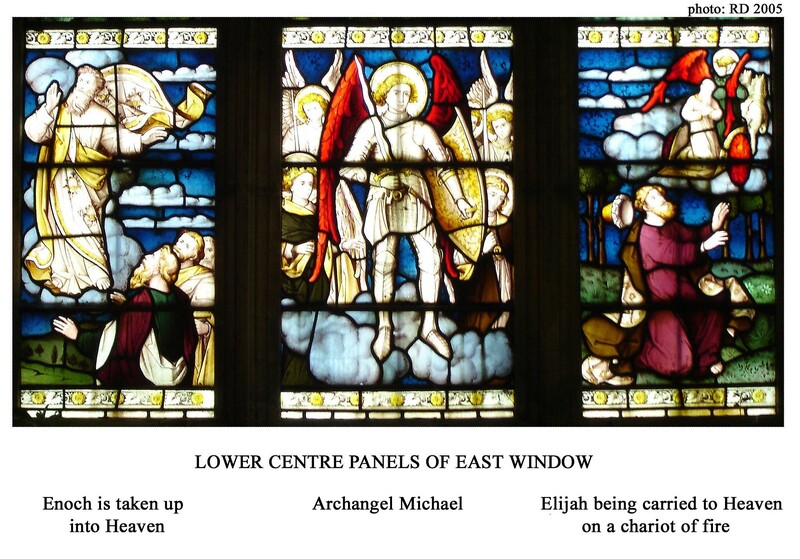 On either side of Michael are two Old Testament ascension images (next detail). On the right is Elijah going up into heaven on a horse-drawn chariot of fire watched by a distressed Elisha: 'My father, my father! The chariots of Israel and its horsemen!'. Elija's cloak (and hat) are seen behind Elisha, who literally and figuratively 'assumed the mantle' (put on the cloak) which had fallen upon him (2 Kings 2:11-13). On the left is Enoch who 'walked with God' and 'by faith was taken up so that he should not see death'. (Gen.5:21-24; Heb.11:5). His story comes from very early biblical tradition. He was great-grandfather of Noah and father of Methuselah (Gen. 5). 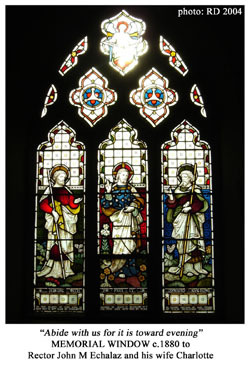 Within the tracery of the Gothic arch at the top of the window (main picture), the small segments contain more heavenly figures, angels and cherubs, around a central symbol of the letters IHS: Iesus Hominum Salvator - Jesus Saviour of men. To left and right are the Greek letters Α (alpha) and Ω (omega) - the beginning and the end; and at the very top is a dove symbolising the Holy Spirit, promised to the disciples by Jesus immediately before his ascension (Acts 1:8). Of the two panels on the extreme left, the upper one is the Supper at Emmaus which followed the invitation of the two disciples to Jesus to 'abide with us' (see the south chancel window above); 'When he was at table with them, he took the bread and blessed, and brake it, and gave it to them. And their eyes were opened and they recognised him' (Luke 24:30-31). The lower one represents the Feeding of the Five Thousand: 'he broke the loaves and gave them to the disciples to set before the people' (Mark 6:35-44). In the upper right panel Jesus commissions Peter, identified by the symbolic keys which he holds: '... I will give you the keys of the kingdom of heaven' (Matthew 16:15-19). Below is Moses descending from Mount Sinai holding the two tablets with the ten commandments (Exodus 34). Aaron (in blue) and all the people were afraid to approach Moses because of his appearance: 'the skin of his face shone because he had been talking with God' (v.29) (25). After the death of Rector Echalaz in 1877, the newly appointed rector was the Revd. Charles Thomas Moore M.A. brother of the squire and patron, George John Moore, their father having died in 1871. Following the death of Mr Falkner, the position of Headmaster of the Grammar School was held for a short period (1870-73) by Revd. Arthur C Wright M.A. and then by Revd William Simpson Bamber M.A. from 1873 until his unexpected death in 1891. In running the School and the Church, Mr Bamber and Rector Moore became close colleagues and friends. Mr Bamber's death, at the age of only 46 years, was a huge loss to Mr Moore both personally and professionally (26). A memorial fund was set up to raise money for a suitable memorial (27). This took the form of a pictorial window placed in the south aisle. 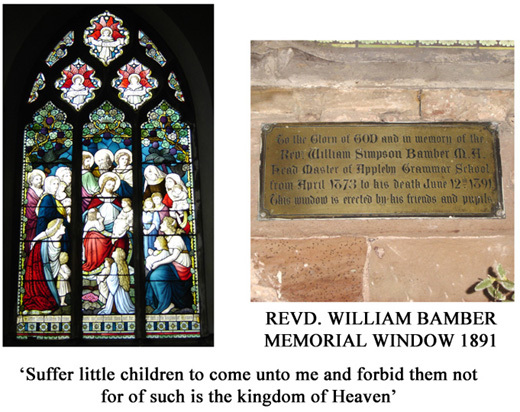 Appropriate to Mr Bamber's work with children, the window illustrates the well-known quotation: Suffer little children to come unto me and forbid them not for of such is the kingdom of heaven (Luke 18:16). The memorial plate records: This window is erected by his friends and pupils. The altar cross is inscribed To the Glory of God and to the dear memory of William Simpson Bamber June 12th 1891. The candle sticks, prayer-book stand and vases all bear the same date. 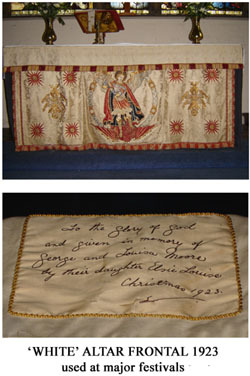 Perhaps the last gift from the Moore family was the white altar frontal given at Christmas 1923 by Elsie Louise Moore in memory of her parents G J Moore (1842-1916) and Louisa Moore (1846-1921). In 1919, her brother Charles who had inherited the financial burden of the Appleby estate, had sold up. Elsie died in 1924 at the age of 35 years and is buried in Appleby cemetery. 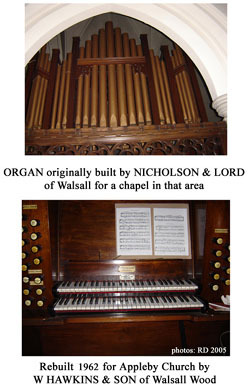 A second replacement organ was installed in 1962. Originally built by Nicholson and Lord of Walsall for a local chapel it was rebuilt for Appleby by W Hawkins & Son, of Walsall Wood , who still maintain it (28). I have referred already to the removal of some of the Victorian fittings in the mid-20th century. A recent view of the church interior is shown in the last photograph. 1. I am grateful to Mr K R Wadd of Knighton who took the trouble to send me diagrams of royal heraldry from this period in September 1979. The Appleby arms, carved in wood, inevitably lack fine detail. What is clear is that they are late Hanoverian, so William IV seems the obvious identity. 2. Leicestershire Record Office (LRO): 15D55/23(b) accounts; and 15D55/33(c) Bishop's letter re consecration and statement of account for the extension. 3. White's Directory of Derbyshire, 1857: 'In 1837 a handsome organ was put up in the church, the gift of the Misses Moore'. 4. I am grateful to the late Mr Gordon Parker and to Mrs Margaret Parker for allowing me to see James Tunnadine's diary. www.british-history.ac.uk/report.asp?compid=22173 and search using: Edit / Find in This Page <William Gray> and <Henry Willis>. 8. Nichols (1811) op.cit., p 433. See also the engraved plate opposite p 431. 9. White, Leicestershire 1846 and Hagar Leicestershire 1849, directories. 10. For the Tractarian movement and the Gothic architectural revival see John Betjeman Collins Guide to Parish Churches of England and Wales 1980 p 63; and, for a less churchy account see: Simon Jenkins England's Thousand Best Churches, Allen Lane, 1999, p xxii. 12. Appleby Church Records from 1870 to1873 (the last receipt) are in 15D55/27, 15D55/26/5 and 15D55/26/6 at the LRO. A list of subscriptions, including George Moore's £100 is in 15D55/27/17. Evidence of his correspondence with architect J P St Aubyn is in 15D55/27/11. In Leicestershire, St Aubyn prepared the designs for enlargement of Whitwick church (1848-50), the new church at Thringstone (1860-63), the enlargement of Holy Trinity at Ashby (1866-67) and the enlargement of St Helens (1878-80). His fees for Appleby are quoted in LRO 15D55/27/29. 17. LRO 15D55/27/3 Drugget was a coarse durable wool fabric often used as a floor or table covering. The Fleur de Lys pattern was clearly a sympathetic choice. 19. White's Directory of Leics and Rutland 1877: A beautiful stone pulpit has been placed in the church, as a memorial to Rev F B Falkner the late headmaster of Appleby school who died in 1870. 26. R Dunmore, This Noble Foundation, Sir John Moore School Foundation, 1992, p 71. 27. Appleby Parish Magazine, Feb 1892. The Rector donated ten guineas and the Squire five pounds to the fund; many others contributed smaller amounts - see In Focus 15. 28. W Hawkins Private Communication 1993-97 (when I was churchwarden). Mr Hawkins remembered working on the reconstruction and installation.